Hallways are often neglected as it is a room that isn't enjoyed and utilised like a lounge and is simply used for entering and exiting. But really, it is the first room in the house which is seen by guests and so it is important that it is welcoming. Many homeowners opt for carpet in hallways which can be a bad move especially if it is the most used entrance in the home. Dirty shoes, wet umbrellas and muddy paws can play havoc on carpets and so we always recommend, if possible, opting for a tile floor. 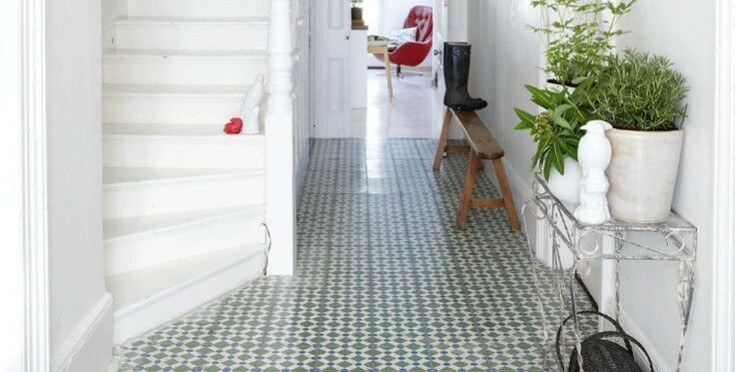 As most hallways tend to be narrow, the space can really pull off statement tiles and can often make the area appear larger. Monochrome tiles are great for this as they add a classic and dramatic feel. Go simple and lay chequered floor or add dimension with a unique pattern. Darker shades have less maintenance than lighter colours and so are much more forgiving if the area hasn't been vacuumed and mopped in a day or two. Grey creates a contemporary atmosphere whilst a deep brown adds warmth. For those who prefer a wooden floor but would rather not have the upkeep of the real thing, try wood-effect tiles. These come in a range of colourways and sizes, and because they are made from porcelain they are non-porous and super strong, making them ideal for heavy usage. Many customers steer away from colour, but bright patterned tiles can really open up the space and sometimes create the effect of an original feature. Mosaics or geometric patterns work perfectly! We hope this blog offers much need inspiration and don't forget that Real Stone & Tile's experts are always on hand in the Cheadle showroom to help you create your dream home.